I will find out where Lebron James is signing while I write this so expect a comment somewhere. I was really scared of today's run. I tried not to let it show, but I couldn't get my head around an 18 mile hill. 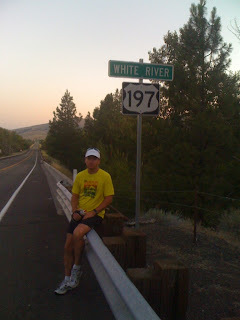 I knew I had 10 miles to the base and my goal was to just get to the Deschutes River with as little drama as possible. 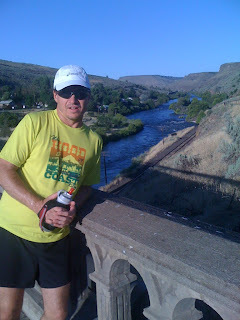 I got a very early start, 5:15, and made sure I ate just before getting to the river, correcting 2 mistakes from yesterday. It was pretty drama free, despite the fact that from the moment I came up out of Tygh Valley I was staring straight into the mountains that would be with me for the rest of day. In Maupin, on the Deschutes River bridge. And then, came the hill. I was really surprised by how good I felt early on the hill and had to keep reminding myself how long it was and to take it easy. I usually manage a run in my head by breaking it into smaller pieces. I never was able to break an 18 mile hill up into anything that made sense or helped. I don't remember exactly where it was but I had the thought that this is what it must have been like for boxers to fight Muhammad Ali. You just keep getting hit with that left jab, over and over again. It's relentless. If you try and get mad or frustrated about it and hit back, wham, you get nailed with the right cross! Eventually, you realize that you can only hope to survive, you can just resign yourself to the jab. It hurt. 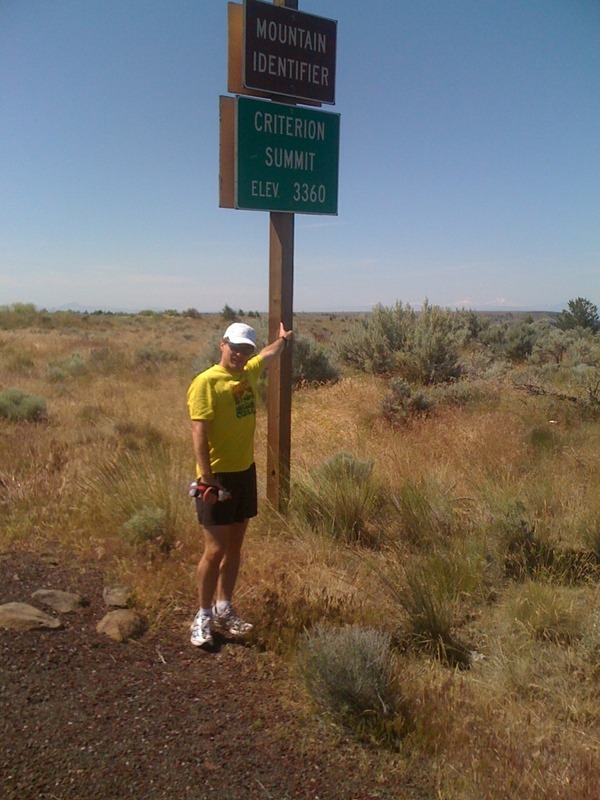 I've never experienced anything like this climb to Criterion Summit. I know there are much bigger climbs out there in the world. The Miami HEAT!!!!! STUPID STUPID STUPID!!!!!!!! If you care so much about your "Legacy", and most people with legacies never cared about them before they had one, this is the worst choice you could make. If you win, it's discounted, and if you don't win, whoooooo boy, you just went from one of the greatest players ever to forgotten! I'm back, just before the top of the summit I saw Sisters for the first time. Well, I saw two of the peaks but that was enough, I got a pretty big surge of energy. Several times, Jeanne walked with me for a little while after the car and that helped a bunch too. She also had some cold Coke in the ice chest and I have become such a huge believer in the psychological powers of Coke late in a long run, it's amazing. Just another bug on the road, with Mt. Hood in the distance. I made an error in measuring yesterday, I think I was closer to 32 miles than 33. Today, I logged 35 before calling it quits for the day. All the big climbs are behind me. I still have 64 miles of running in very hot weather, and I'm not taking that lightly, but I am very relieved to be up and over that hill! Loved your choice of shirts for today's run. 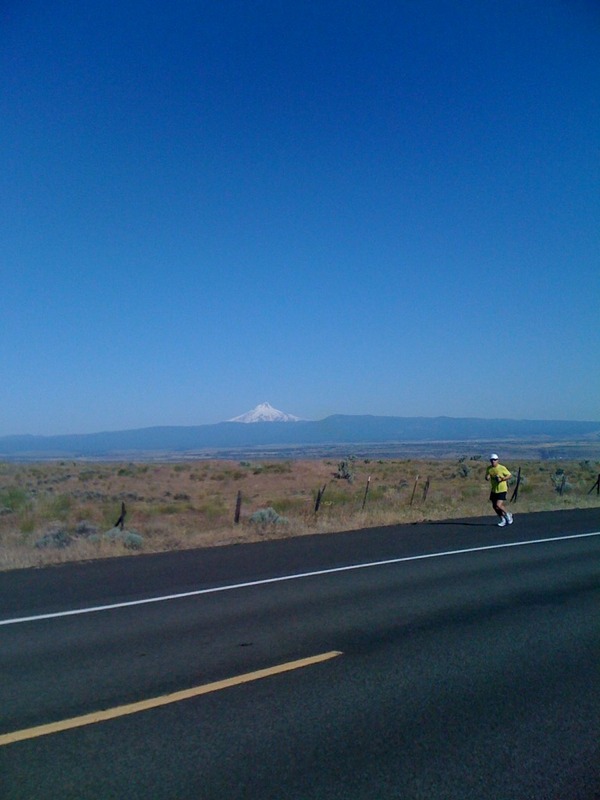 A Hood to Coast Race must barely seem like a warm up for something like Sisters to Sisters. Your analogy of the hill being like in a heavyweight boxing match against Muhammad Ali was quite entertaining, and probably very true.